It’s only a week until my book is available for purchase! It was originally scheduled to be released on August 15th but the process of producing the book has gone really well so Apress decided to publish it a whole month earlier. So mark July 15th in you calendar cause that’s when it’s finally coming out! The title of the book has changed slightly, from Beginning Google Maps Applications to Beginning Google Maps API 3. I think the new title better reflects the content of the book. It’s after all about version 3 of the API. I can’t even begin to describe how excited I am that my book is finally finished! It’s taken me over a year to complete it but oh how good it feels right now! If you’re interested in buying it, it’s available for pre-order at Amazon.com and a week from now, it will be available for purchase. I hope that you’ll enjoy it as much as I’ve enjoyed writing it! Congratulations. I’m really looking forward to reading the book. Any idea if or when this book might be released on kindle? Great timing I’m busy re-rewriting my site. Just bought the e-book version. This is awesome. I can finally start to stop supporting the book we wrote in 2005/2006! Gabriel, I hope your book has at least as long and successful a run as ours did. It certainly is a fun ride interacting with readers and seeing what they turn your examples into! I created a map querying data from an Oracle database. I also have another report in the same page that uses the same query to report. If possible, I would like to enable one of the values in the report to be a link to popup the appropriate info window in the map. How can I do this, I see a lot of example on the web but they are generating HTML as part of creating the map. I am not doing that. I just received your book in the mail yesterday from Amazon and it looks great! 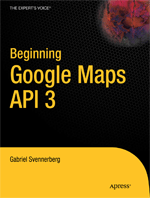 I am a newbie to Google Maps and the API and your book will be very helpful as a supplement to the online documentation. I think Google Maps – along with Fusion Tables and the addition of libraries such as the Geometry Library will allow collaborative synergy that will soon leapfrog desktop implementations of GIS. Your book is the first to touch on this topic and I commend you. Needed a quick introduction to Google Maps to add a link to Google. I had to display geo coded images with maps for our vertical. After wandering around Amazon for a while, bought this book.